Pau Gasol had 20 points and 19 rebounds for the Lakers. CHICAGO (AP) — Taj Gibson made a layup at the buzzer in overtime, lifting the Chicago Bulls to a 102-100 victory over the Los Angeles Lakers on Monday night. With nine-tenths of a second left, Mike Dunleavy inbounded from underneath the basket and found Gibson cutting down the middle. The athletic forward then muscled toward the hoop for the winning basket, which was confirmed by a video review by the officials. Joakim Noah had 17 points, 21 rebounds and six assists for Chicago (20-20), which has won eight of 10 to get back to .500 for the first time since Nov. 27. D.J. Augustin had a season-high 27 points, and Jimmy Butler finished with 13 points and 11 rebounds. Nick Young had 31 points for the Lakers (16-26), including a tying baseline jumper with 6 seconds left in overtime. The streaky sub also made three free throws with 4.1 seconds left in regulation, tying it at 93. The Lakers scored the first five points in overtime, but Augustin led the Bulls right back. After Gibson made two foul shots, Augustin hit a tying 3-pointer and drove inside for a layup that gave Chicago a 100-98 lead with 1:30 left. Augustin was 10 for 16 from the field, including a 5-for-7 performance from beyond the arc. He shouldered the load at the point for most of the game after Kirk Hinrich departed in the third with a hamstring injury. 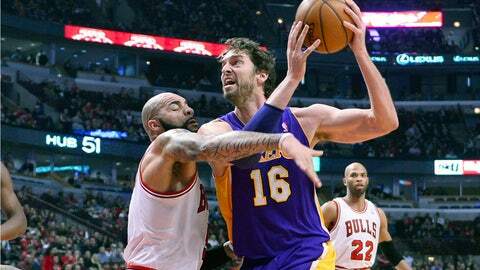 Pau Gasol had 20 points and 19 rebounds for Los Angeles, which had won two in a row after a six-game losing streak. Jodie Meeks added 16 points and seven assists. The Lakers’ visit to Chicago had none of the usual luster that had been a staple of the games between two of the NBA’s most successful franchises over the years. The best players on each team are sidelined by serious injuries, making it next to impossible for Los Angeles to keep up in the loaded Western Conference and casting doubt on Chicago’s goal of winning the title. Los Angeles is playing without star guards Kobe Bryant and Steve Nash, the headliners of a long list of injuries for the Lakers, especially in the backcourt. Bryant broke a bone in his left knee Dec. 17 at Memphis, and Nash is out with a back problem. "Just been riding the bike, trying to stay in shape that way," Bryant said before the game against Chicago. "Not much I can really do in terms of running and things of that nature. Mainly just focused on doing bike work." While Bryant and Nash could return in the next couple of weeks, the Bulls will play the rest of the season without star point guard Derrick Rose. The 2011 NBA MVP had surgery on Nov. 25 after he tore the medial meniscus in his right knee in a game at Portland. Chicago also traded All-Star Luol Deng to Cleveland on Jan. 7 for draft picks and Andrew Bynum, and then promptly waived the enigmatic center in a salary dump. Bryant knows how Rose is feeling. Rose also missed all of last season while recovering from a torn anterior cruciate ligament in his left knee, and Bryant was sidelined for the end of last season and the beginning of this one due to a torn left Achilles tendon. "There’s really nothing you can do about it. It is what it is," Bryant said. "It’s unfortunate but you have two options and one is to lay down and not do anything about it and the second is to get up and get to work. I think the second one is more appealing to him, for sure." With Bryant watching from the sideline, the Lakers rallied after a slow start. Young had 13 of his 17 first-half points in the second quarter as Los Angeles erased a five-point deficit on their way to a 52-49 lead at the break. Meeks also had 12 points in the first half. Noah had 11 points and 10 rebounds at halftime, continuing a career-best run that could lead to a second straight All-Star appearance for the post player. He has grabbed at least 10 boards in 13 straight games for the franchise’s longest streak since Tyson Chandler also had a 13-game run during the 2006-07 season. NOTES: Lakers swingman Xavier Henry (right knee bone bruise) could return soon. He is expected to step up his rehab work when the Lakers practice Wednesday in Miami. … The Bulls announced earlier in the day that they had re-signed F Cartier Martin to a second 10-day contract. … The Bulls and Lakers split two games last season. They play again Feb. 9 in Los Angeles.